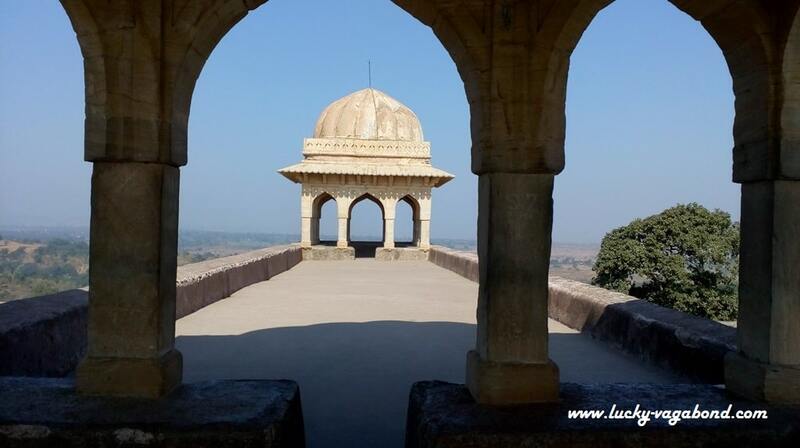 From the courtyard of Rani Roopmati Pavilion, the king used to enjoy the songs recited by his queen. Rewa kund, a small pond fed by river Narmada water from an underground crevice was also rebuilt by Baz Bahadur. Bath in this pond has significance equivalent to river Narmada. Aqueducts were built to transport water from this pond to Baaz Bahadur Palace, which is just opposite to this pond. However, love has many enemies. An attack by powerful Mughal army led to tragic end to this fairy tale love story. Defeated Baz Bahadur escaped to nearby kingdoms and Queen Roopmati killed herself in order to preserve her honour from the Mughals. Perhaps that was the only option to the womenfolk to safeguard their honour against the invaders in those times. 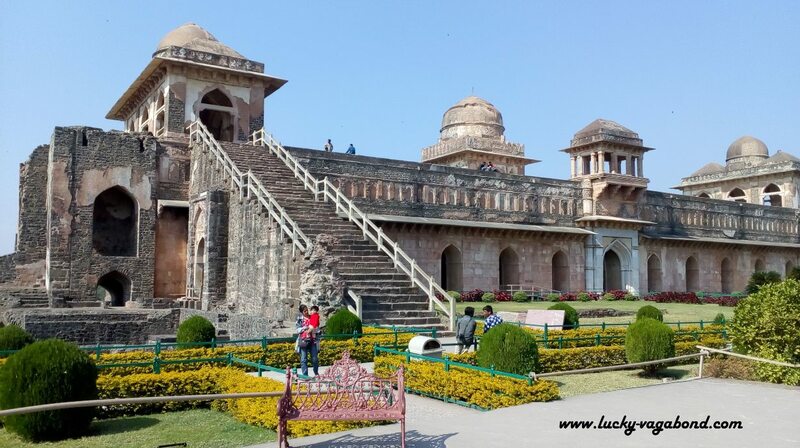 Other than legend of Baz Bahadur and Roopmati, Mandu was also occupied by Khiljis and Mughals for some time. Reign of Ghiyas-ud-din Khilji was notable as he gifted Mandu with masterpiece architectural marvels like Jahaz Mahal and Hindola Mahal in 15th century. Jahaz Mahal (Palace) has been created like a ship floating on the sea. Jahaz Mahal is approx. 110 m. x 15 m., much like a sea vessel. Grandiose of this monument actually starts a thinking process, basically what was the purpose behind construction at this spot when Delhi was the capital of Khilji dynasty? This beautiful palace was built to house women, in fact thousands of women as royal consorts. Actually this palace served as harem of then Khilji king of Mandu. Artificial lakes were created around it, to give this mammoth structure an impression of vessel floating in the sea for this monument. That’s why the name Jahaz Mahal. (Jahaz means ship in Hindi). Adjacent to Jahaz Mahal is the Hindola Mahal, called as Swinging Palace due to sloping outer walls. Designed like a swing, this large meeting Hall has notable ventilated roofs/ windows. (Hindola means Swing in Hindi). This is a rare example of simple yet effective Afghan architecture style monument in India. On windy evening one can clearly hear romantic tunes created by windows and ventilated roofs. Other than these 2 noteworthy monuments, ruins in the premises also hold high despite neglect of centuries. Ruins are spread across 10 km. x 15 km. area all throughout the Mandu. While moving on to Rani Roopmati Mahal, take a stopover at ECHO Point and enjoy your voice echoing in the mountains. Akbar, then Mughal King during one of his visits had ordered destruction of most of the buildings to avoid use by enemies as military base. What an idea? "I know of no other place that is as pleasant in climate and with such attractive scenery as Mandu in the rainy season." Besides the ruins, there is a temple dedicated to Lord Shiva which attracts pilgrims from nearby places, Neelkanth Mahadev temple. Temple is situated downhill from the road and can be missed easily, take care while driving. You will definitely enjoy the time spent here. While roaming around Mandu, came across a white matter being sold in small packets. Known as it is known as Mandu ki Imli, this is the baobab fruit of African origin. This fruit grows in abundance in Mandu and the powder of Baobab fruit is mixed in water with sugar and consumed as local drink. After Mandu, next destination on our itinerary was Maheshwar.